Incredible high level of ozone. 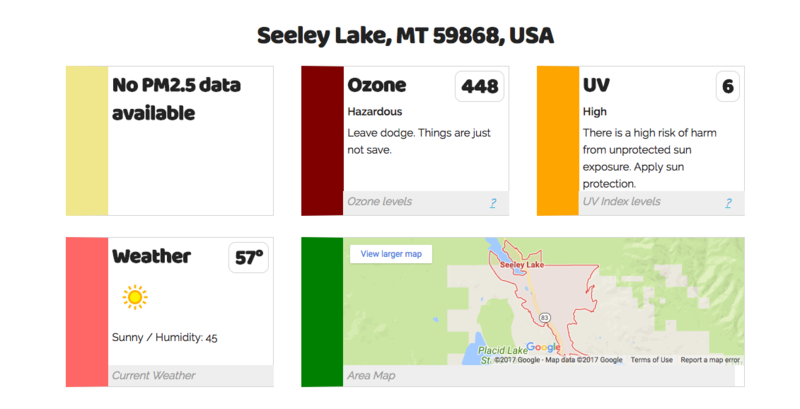 On, Sept. 12th, 2017, the small town of Seeley Lake, MT had the highest Ozone levels I ever have seen, a whopping 448 on the EPA scale. FYI, 500 is as high as the EPA range goes. Unhealthy to say the least. The reason for this high levels of ozone stems likely from the many forest fires nearby. It is unfortunate we could not get a reading of the PM2.5 count. I’m sure it was over the roof. Luckily severe conditions like the one seen in Seeley will clean out fast. Levels like that are just not healthy in the long run. FYI: Usually, this area is a gem for hiking, fishing and all things outdoors.